I remember the days when phone booths were plentiful. You would hear the noises and bells as you put your change into them- do they still make those noises? The phone numbers used to be posted so you could give the number to someone so they could call you back when your change ran out. Those things were also ‘built like a tank’. Eventually they removed the phone numbers from payphones, but some people like me knew the 3 digit number you could dial to get a mechanized voice giving you the phone number you were calling from- free of charge. Then they disabled the ringers so that even if someone called you wouldn’t hear anything. As I recall they did that to stop drug dealers from doing business over pay phones. 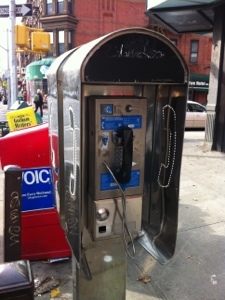 At least in the earlier days of cell phones when they were still too expensive for casual use I would seek out payphones for a cheap call, but I remember the problem with that was most of the payphones that I found did not work and usually did not return your money. People brought up on cell phones missed that experience- and rotary dials! Who would have guessed back then that you could be walking down the street while talking to someone doing the same in a different country? What a concept phone booths were, built to contain your conversation in some sort of privacy from others instead of hearing people yelling their affairs without a thought of themselves or others. I find it somewhat ironic that laws were passed, bands of radio frequencies deleted from receivers, and even accidentally tuning a radio (or old TV VHF tuner) to a cellular frequency made a crime to keep cell conversations ‘private’. All that and people everywhere are seemingly yelling their ‘private’ conversations everywhere they go. I guess that’s progress. What ever happened to two cans and a string? I’ve yet to patent my improvement on that. Two cans with a lit candle in each connected by a fiber optic cable. On the topic of blast from the past, I still have a telegraph key! I never learned morse code much beyond the … — … of an SOS, but it did provide me with a science project or two way back when. Even amateur radio operators have for the most part gotten away from morse code. Now days you can find free software to covert your PC into a morse receiver/ transmitter. Fidigi is one such program and it also converts to other formats such as radio teletype. If you want a truly unique ringtone on your phone Fidigi can save your message to an audio file. A ringtone of an RTTY or morse code “You have mail” will almost surely turn a few heads and not be confused with anyone else’s phone.